Okay, I’m dating myself by singing Kool & The Gang here (can you hear me? ), but CELEBRATION was truly the atmosphere at the recent BERNINA 830LE VIP events! “WOO-HOO”! 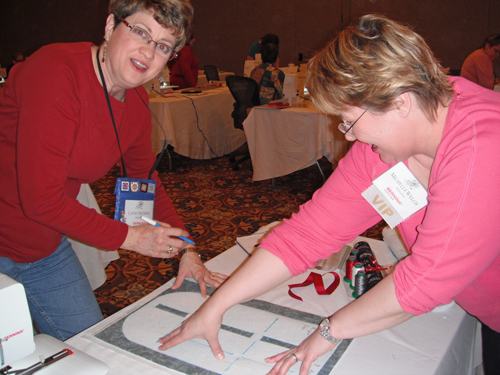 With close to 90 attendees per session, the events were bustling with smiles, enthusiasm, the snip of scissors, hum of BERNINA machines, and lots & lots of laughter! It was wonderful to actually meet all the VIP’s in person and watch them make fast (new) friends! Rave reviews were shared about the hands-on projects each attendee accomplished and I saw the awesome results first-hand. If YOU recently purchased the awesome BERNINA 830LE, or are thinking about purchasing one of the few remaining machines soon, I HIGHLY recommend you come join us in Chicago-land for this exciting event! But don’t just take MY word for it, our attendees’ comments speak for themselves! Four more dates have been added for 2012, two in August and two in December. For more information visit www.bernina8series.com.